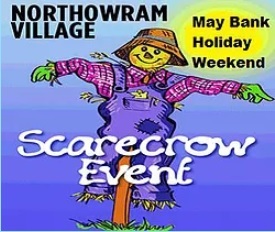 Northowram Scarecrow Festival is a FREE family event that takes place this year on the May Bank Holiday weekend Saturday 4 -Monday 6 May. There’s fun for all the family at Northowram Village, Halifax, where in addition to the Scarecrow Trail there’s a Fun Dog Show, Bake Off, BBQ, Live Music, Children’s Games, Raffle and Tombola. Please can you help the Scarecrow Event to support the local community. The organisers are asking residents and local businesses alike to donate raffle and tombola prizes. To help us please we have 2 drop off points – The Club on Northowram Green and The Shoulder of Mutton on Towngate. Each category winner and runner-up will receive a rosette and certificate. The ‘Helen Silson’ trophy will be awarded to the scarecrow voted best by the Judges from all those entered. Also as usual there will be an award for the scarecrow voted top in the ‘People’s vote’. 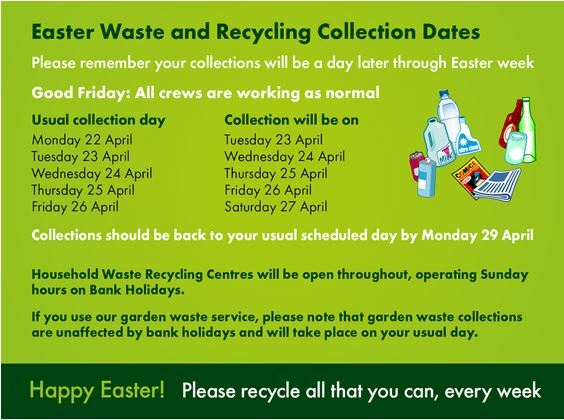 Please remember your Waste and Recycling Collections will be a day later through Easter and bank holiday weeks. The Waste and Recycling Easter eZine can be downloaded as the Waste and Recycling eZine Easter 2019. 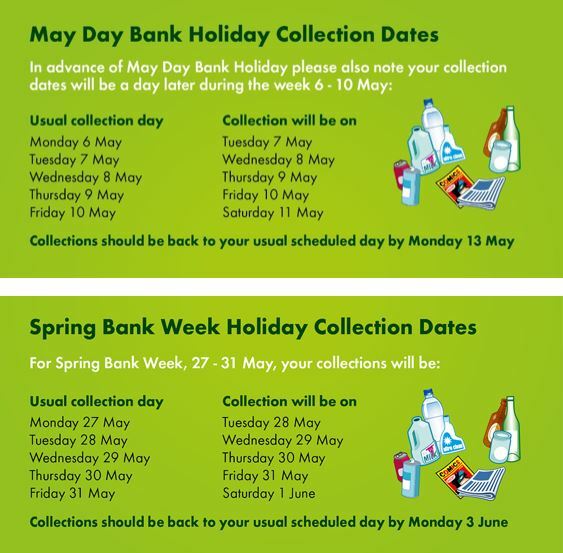 Collections should be back to your usual scheduled day by Monday 3 June. Please remember also to squash your cans and plastics before placing them in the white bag; they will take up less room so you can fit more in the sack and it will help the items to stay more securely inside the sack on a windy day. Boothtown and Southowram Methodist Church, Akroydon, Halifax HX3 6LR will be holding a Easter Fair on Saturday 6 April, 11:00am-2:00pm. Enter via the main Church Door (opposite the Post Office) and entrance is FREE. There will be lots of craft stalls along with hot food (including a vegetarian options) and fun games stalls for all the family. Proceeds will be split between a homeless charity and the church. To find out the latest from the Northowram and Shelf Ward Forum held on Thursday 7 March, you can download the minutes here. 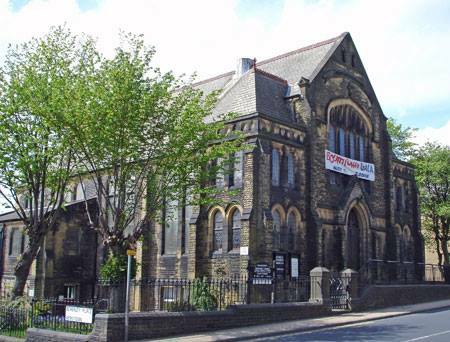 Venue: Northowram Methodist Church, Northowram Green. Northowram. Halifax. Present: Cllr S Baines; Cllr R Taylor; Cliff Organ (Chair); Tony King Ward Coordinator (OMI); 19 Residents. 1.1 Cliff Organ began by thanking everyone for attending the meeting and introducing the officers and councillors present. 2. Minutes and Matters arising. 3.8 Deliberate fires no change from last year with 11 offences being committed. 4.1 Several residents raised concerns about the mini roundabout junction of Cooper lane – Carr House lane, where some drivers travel at speed towards the roundabout don’t stop and go straight over the roundabout. It was stated there have been several minor collisions and a lot more near misses and residents were concerned about the safety of pedestrians. The police are aware of the problems concerning this roundabout, it is unlikely that there will be any work undertaken to improve the roundabout. a major reason for it to be refused is the fact that it is in a conservation area. around Hall Lane and Upper lane. Action; TK to forward information to CMBC. charges re removal are now 8 items for £25. ward. Action; TK to speak to SCG manager and find out. onto the Police’s operation Hawmill. management company and ask if bushes can be cut back and rubbish removed. 4.10 No update on the future of the Yew Tree public house. TK to pass onto police and community safety wardens. neighbourhood watch facebook pages which are an excellent source of information for what’s going on in the ward area. Also he asked if there was any interest in residents wanting to set up a neighbourhood watch group in their area, no response from residents. 8.1 There is no update on the LDP. 9a TK explained that the most recent grant applications had been received from the friends of Shelf Hall Park, for £500 to erect a new ‘Welcome to Shelf Hall Park’ sign and from Shelf Hall Park Bowls Group for new gutter boarding for around the green. would like to be on the grants panel. No one was interested in becoming a member of the grants panel and were happy for the panel to continue as is. 10.1 The Shibden Village Society is looking for new members anyone wanting more information please check out the www.Northowram.org website. Belgrave Social Club, Claremount Road. Claremount. Halifax. The fascinating life of Anne Lister will be honoured by a blue plaque at Shibden Hall, Halifax. Helena Whitbread – historian, biographer and editor of Anne Lister’s diaries – began studying the journals over 30 years ago. She published the first volume in 1988 and the second volume in 1993. Jill Liddington, Honorary Research Fellow at Leeds University, wrote the books Female Fortune and Nature’s Domain, which inspired the Gentleman Jack series. On Wednesday 3 April, 3:30pm the event will start with a free talk by Helena and Jill in Shibden Hall’s Aisled Barn. Places are limited so advance booking is essential through Eventbrite. At 4.30pm the blue plaque unveiling will take place outside the front entrance to the Hall by the lawn. This is also free to attend. 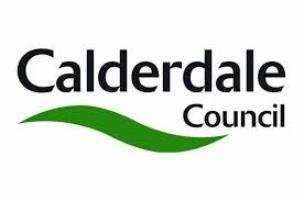 The Mayor of Calderdale, Cllr Marcus Thompson, will officially unveil the plaque. Shibden Hall will be open as normal on Wednesday 3 April, from 10am to 5pm, and the usual entry charges apply.